So I thought I'd give you a bit of an update as to where I am! I'm currently in the United States of America. I returned to the Lily Yip Table Tennis Center and have been training my bum off with some really top quality training partners. Getting back into multiball training has been hard but the gym sessions have started and I'm really starting to get back into fighting shape. A 6 player team from Shandong, China arrived a few days ago and play at an amazing level. Along with the Canadian Junior Girls team they have provided the backbone of a 5 day training camp run at the centre and we were lucky enough to also be joined by 2012 US Olympian, Ariel Hsing. In between training days Ariel also took some time to lead Princeton in winning the NCTTA championship at the club and also showed no fear in taking on the Shandong players in the games. So in just a few days I head to Washington D.C for the North American Team Championships. The top team from Tianjin, China features former China National Team player, Hao Shuai. The 2nd seeds hail from Fujian and further down the seedings, German National Coach Jorg Rosskopf makes an appearance. It's going to be an amazing tournament so hopefully I can get some kind of coverage there, though I will be focusing on playing for most of the time. So, enjoying my time here so far. Please take a moment to check out http://www.lilyttc.com/ the homepage of Lily's club. It is an ITTF Hotspot training centre and has a great squad of coaches and training events throughout the year. This Breakdown Blog centres on the World Cup Final between Xu Xin and Vladimir Samsonov, a rematch of the bronze medal match in 2012 but this time with the Chinese player coming out on top and taking the World Cup Title. Samsonov had shown incredible consistency to make it to the final, overcoming Timo Boll by 4 games to 0, while Xu Xin played his usual wide angle shots to decimate the field. Xu Xin is obviously aware of Samsonov's ability to pick up half long balls on his forehand, so the majority of his service returns are focused on Vladi's backhand side. This time Xu focuses a lot more on 3rd ball openers with more spin, he definitely focuses more on the 5th ball as the ball to play a winner on. In some examples he simply plays at 80% pace and looks for an opening in Samsonov's defence. Towards the end of the 2nd set we see Samsonov focusing more on the pivot zone for Xu Xin, he knows he can push the ball deeper there with more confidence and even opens with a few long fast serves into the backhand. Samsonov capitalises on variation in these few points, playing a fast serve and then following up with a slow block. During the match Samsonov's long fast serve actually forces a few errors from Xu Xin simply on service return. Samsonov really presses the ball into the backhand corner on a number of occasions in the rally, trying to catch Xu Xin off balance or reduce his stable base and the power in his shots which opens up the chance to hit down the line. As usual however Xu Xin shows his ability to adjust his body position in order to play shots out of position. Interestingly there are not many instances of rallies back from the table, both players seem to recognise the capability of each other further back from the table and there is a conscious effort to keep the game close to the table. Unfortunately for Samsonov this results in a few errors as he tries to take the ball too early on a number of occasions, the pressure is definitely on him to beat the odds in this match. Knowing the amount of control Samsonov can achieve on his backhand side, Xu's bigger openings out of his pivot zone are crosscourt as wide as he can get to the forehand. If he were to play the fast ball down the line to the backhand then Samsonov has the angle on him across the whole table. Xu Xin shows his dominance in the match overall, Samsonov tends to play longer on service receive, where Xu plays tight. The openings created for Xu are more frequent and he takes full advantage of them, not playing too hard or fast until the right opportunity arises. Xu attacks in the match much more than Samsonov, Vladi almost appears on the defensive in a large proportion of cases and Xu really takes advantage of that, he has the opportunity to continue hitting balls and looking for gaps in that defence and on more than half of the occasions he finds one. So Xu Xin, the victor 4-1. How and when did you start playing table tennis? Who influenced you during your early years? I started to play table tennis when I was 5 years old. Both of my older sisters played table tennis as well, and my father was the coach, so it was natural for me to start this sport. I don’t regret that I was born in a table tennis family. I am happy that sport is in our daily lives. This year you were crowned Hungarian National Champion, did you feel before the competition that you had a strong chance to win the title? What are your big goals for 2014 in table tennis? First of all to making my consistency better in Bundesliga. And get some possibilities at national team to play pro tours and improve my world ranking. Do you play in a league? Which club do you play for? Yes I play in Germany. My club name is SV-DJK Kolbermoor. It’s in the the Bayern area. I like the atmosphere there. Tell us a bit more about your experience with the Challenger Series, how is the level of competition and will you compete in it again perhaps next year? It’s a very well organised competition. It’s also a high level competition, and a good experience, and a good possibility to play very good matches. Now I am busier because of my school, but if I have time I’ll play again. What is it that you like about table tennis as a sport which makes you want to keep playing and training? For me it’s more important what sport teaches to you. I like the travelling, to see a lot of countries. I like the atmosphere of the competitions, to watch the very good players. I like the speed in table tennis, and that it improves your concentration like every sport but (almost) mostly table tennis. Do you think girls in table tennis should wear skirts or shorts? I like the last years new fashion, that girls wear skirts. For me its more comfortable and I like that every company improves the lady style. Every year we get better and better equipment and clothing. What is your most memorable moment since starting to play table tennis? To win EYOF in Beograd in single and double. To play final in team at Europeans in Cadet and Junior as well. To win the Hungarian national championship. To play in the same team with my both sister at home. What is your favourite training exercise to practice and why? Backhand-forehand-backhand-middle-backhand-forehand(from backhand side)-and forehand. I don’t know, I just like to do this exercise if I want to play safety and also to make foot work. What do you like to do for fun when you aren't playing table tennis? I like to be with my family, friends, and with my boyfriend. I like to go walking, watch movies, read books, go to shopping centres and go for parties. What is your best advice to other developing table tennis players around the world for their success? Before I started playing table tennis I went to a tournament which my brother played in with my parents. He won a medal and he was very happy. When I got back home I say to my parents I also want to start to play. I started when I was 6 and a half years old. My coach Gheorghe Bozga also help me a lot, he died 3 years ago and I miss him a lot and still think what he was saying to me before. Obviously you also have your brother Hunor. The two of you both won the Romanian National Championships men's and women's singles titles last year, how much does that mean for you? For me it was the second time I win the Romanian Senior National Championships, I won when I was 16 and 17 years old. For my brother was for the first time and we are happy for each other when we win. It's also nice to hear when Szocs siblings win national champs in singles. You must be very proud of your brother too, I know when my sister used to play we were very competitive. 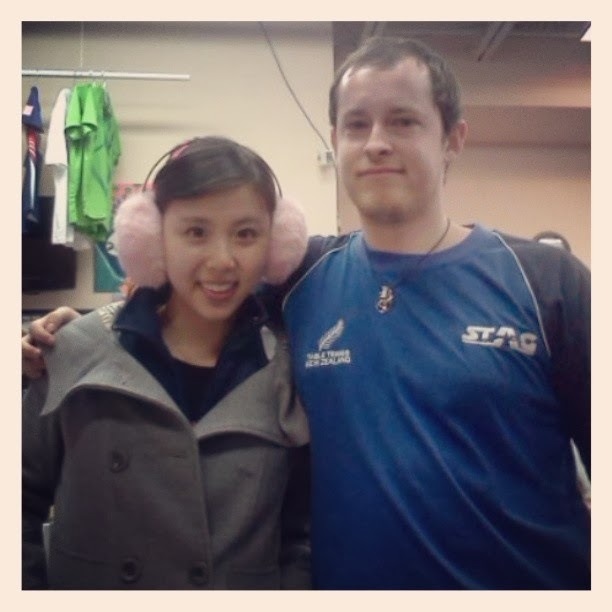 All the time he is happy and near to me and he help me to win and also I am like this with him. What is your most memorable moment in your table tennis career so far? I have so many memorable moments from tt, so I can't start to say and write everything. I was really happy first time I win European Youth Championships singles title and my parents were there to watch. I also had a really good match with Singapore girl (Feng Tianwei) in WTTC and don't forget I win one set with Ding Ning! What were the most satisfying moments for you in 2013? This year I have best results in European Senior Championships and European Youth Champs for Romanian player. I also win Europe top 10. You now live with your brother and train in Bremen, Germany and play in French league, how is this working for you? Have you considered playing in the German league in the future? Yes I live in Bremen with my sweet brother. I play in the French League it's a very good club. We are like family here we always help each other. I thought about German league when I was in Romania but now I find really good club and it's difficult league with lots of Chinese players and it's good for me for future to have really good matches. 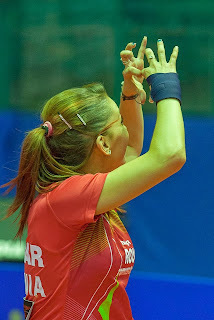 I play in team with Valeria Borza, Agnes Le Lannic and Xiaoxin Yang. How much has injury effected you in the past couple of years? We usually see you decorated with strapping tape while playing. Has it been difficult to keep achieving so much whilst inured? I was injured more than 2 years my arm muscle have problems so it was really difficult to play and also problem with my knee and back. I still have some injury now but I start more physical exercise, now I try to play without tape. You have to think how to play 2 years with injury. You won back to back European Youth Championships titles in 2011 and 2012. Do you think you have a good chance now to win a medal in the European Senior Championships? I trust that I can do it one time and maybe more time. Junior is different, in senior you need more experience but I like so much to play in senior. When I play with Chinese players or with players older than me and play with players better than me I fight and I think like this. I don't have anything to lose against them and I fight and be focused, if I win it's a good result, if I lose it's not a problem. I want to lose fighting, not lose and not play and fight. You like photography and fashion/modelling. Do you think Table Tennis needs more of this to promote and get more girls into the sport? I really like photoshooting. When I have free time all the time I like to try and take some pictures. So many people ask me that I can be model, but I don't want it. I am table tennis player and I love what I do, photoshooting it's another thing than modelling. What will you be doing to make sure you can qualify for the Olympic Games in Rio in 2016? I hope that I will be qualified because for now it is my dream to be in Rio 2016. I try to have good ranking. What is your biggest dream for table tennis in the future? To win European Championships, maybe to win more than once. After world championships and then to be first 4 in Olympic Games, first to be qualified for Rio 2016. 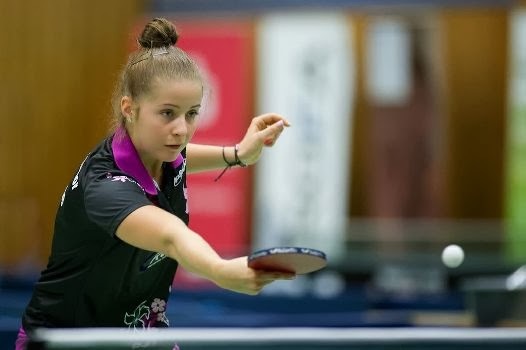 Is it hard being a young female and giving up so much of your time and social life to train and compete in table tennis? Do you have any regrets? No I don't have any regrets because I love what I do. When I was small I wasn't like a baby to have everything I was always with Table Tennis. Other children have a nice life and I have a sport life and I love it! Now so many people know me because of my sport life, I am proud of what I do. What do you enjoy doing while you aren't playing table tennis? Ah I like to go shopping and get manicures. I like to dance and play other sport. I like dance clubs but I don't have so much time for things like this and I like to go on holiday. After table tennis I want to have a beauty salon. Favourite Food: Whatever my grandma cooks. Favourite Holiday Destination: My favourite destination in holiday is...tt :) because now I still play and I don't have holiday, when another people have holiday I went to European Junior Champs. So from now I will see where I like because I am not anymore a junior and I can have holiday. If you won a million dollars what would you spend it on first? When I was young my parents spend a lot of money for tt on me and also my brother, so I would do something for them.